BOGOTA, Colombia -- A consortium led by Italy’s Impregilo receives a contract to build state-run Isagen’s Sogamoso hydroelectric project in Colombia, Impregilo reported. For more information, click here. BRUSSELS, Belgium -- Organizers of Hidroenergia 2010, The International Congress and Exhibition on Small Hydropower, announce they are still accepting abstracts for papers and that a prize will be awarded to a winning project. LEVALLOIS-PERRET, France -- Alstom’s Energy Management Business is offering its Series 6 suite of power plant control and automation technology to the North American market, the company reported. For more information, click here. BEIJING, China -- China Hydroelectric Corporation plans to sell American depository shares in an initial public offering, with the intent to use proceeds to acquire hydroelectric assets in China. For more information, click here. CALGARY, Alberta, Canada -- Fort Chicago Energy Partners enter into a purchase agreement to buy the 33-MW Northbrook hydro facility in New York, Fort Chicago announced. When a major failure occurred in Unit 3 at G.M. Shrum, BC Hydro used innovative repair methods to get the unit back on line in just 14 months. 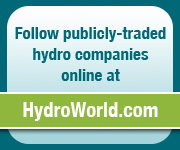 BOCA RATON, Fla. -- Hydro Alternative Energy Inc. has acquired Water Power Technologies LLC, giving it the licensing rights to patent-pending technology. Brazil's water and electricity regulatory agencies are working together to streamline hydraulic basin studies for hydroelectric projects. TULSA, Okla. -- Proponents of wave and tidal power have compared the state of this field of the renewable energy sector with the early days of wind power. The technology has great potential but still must prove itself before it can be widely deployed.